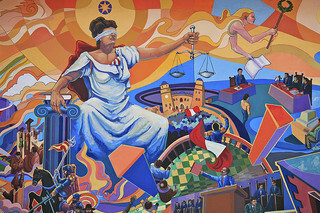 Justice is the central value of our legal dispute resolution system. It’s the standard by which we judge the actions of the parties to see how they measure-up. Yet Justice doesn’t exist for the parties. It’s not for them. It’s for the rest of us. The legal system serves Justice so the rest of us will continue to have confidence in it. When the rest of us are confident that our legal dispute resolution system is just and creates just results, we’re more likely to trust it with our own disputes. That’s not to say that the people who are in the thick of a dispute don’t also have a sense of Justice. They usually do. Justice is a mantle they drape over their shoulders to cloak themselves in righteousness and justify their positions. They adopt it to gain allies to support them, to tell them they’re right and are justified in holding their positions. They may use the language of Justice to try to persuade the person they’ve got the dispute with that they’re right (it rarely does). They may think appealing to Justice will convince me, the mediator, that they’re right (that never happens). Yet Justice begins as a value that comes from outside the parties. It is external to them. Justice can become part of the parties’ beliefs. It shapes their internal standard of Fairness. But it does not come from within themselves. It does not form the earliest, most deeply-seated beliefs about what’s fair. Fairness seems to be a central value we inherit genetically. Each of us starts with some innate sense of Fairness, which we then build-on to construct our own complex belief system. It’s based on our unique upbringing, social and cultural conditioning and life experiences. These ideas of Fairness form the parties’ most deeply-felt beliefs and values and shape their highest and most important goals. For each of us, our sense of Fairness is more nuanced and rich, more deeply-held and much more personal than Justice. We do best in mediation when we get beyond the external ideas of Justice that we may have taken upon ourselves. We do best when we dig down deep and get back to our uniquely personal sense of Fairness. When the discussions can be grounded in these deeply-held and personal values we can form more effective and sustainable resolutions. When people with disputes are working toward an agreement in a mediation, and they focus on what seems fair to them – on what’s most important to them – they can do better than Justice. This entry was posted on Tuesday, September 25th, 2012 at 11:18 am and is filed under ADR, Conflict Resolution, Dispute Resolution, Mediation, Negotiation. You can follow any responses to this entry through the RSS 2.0 feed. You can leave a response, or trackback from your own site.